Fresh vegetables with hummus. You can make your own hummus using this very easy hummus recipe. Some of our favorite veggie to serve are carrots, celery, cucumbers, grape tomatoes, snap peas, broccoli, and cauliflower. Fresh fruit tray. Slice up a few different fruits and watch them disappear. Anytime we have fruit on the counter it is gone in no time at all. Some of our favorite are watermelon, cantaloupe, grapes, strawberries, and apples. Cheese tray with whole wheat crackers. Find a variety of cheese in your local grocery store and serve it up with whole wheat crackers. Some nice ones to use are gouda, cheddar, mozzarella, etc. Try adding in a cheese too that you’ve never tried along with some of your favorites. Meatballs! They aren’t just for spaghetti or meatball subs. Cook up this recipe for meatballs and they’ll also be gone in no time! What are some of your favorite healthy snacks? What are you favorite sports to watch? Who are your favorite teams? 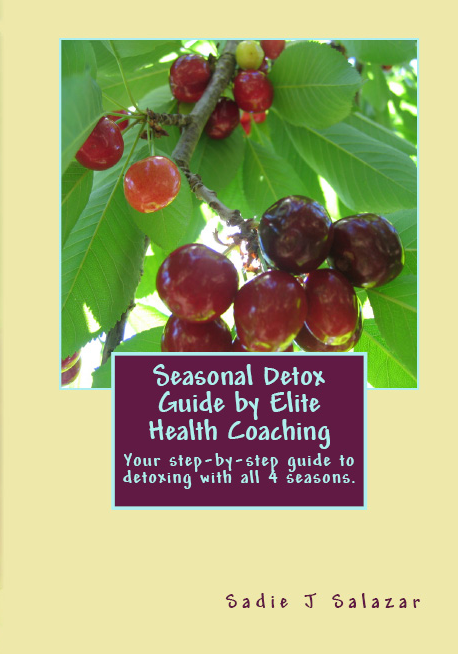 Elite Health Coaching is so excited to announce that their Seasonal Detox Guide is now available for wholesale purchase! If you own a bookstore, salon, chiropractic office, or other business focusing on health and wellness this could be a great opportunity for you to grow your products. This is also a great opportunity for other Health Coaches, and these can be used as a great client gift, especially if one of your sessions or even your focus is healthy cleansing and detoxing done with out any pills or potions or starvation techniques. Feel lighter! Feel more coherent! Feel more energized! All from eating healthy, whole, natural foods. Fill out the form below to find out more information about the Elite Health Coaching Seasonal Detox Guide and how you can offer it to your customers and clients! What is the Veggie Pledge? If you want to lose weight and be healthier, there are diets out there that will work for almost anyone! A plant-based diet is a great place to start! Plant based diets can be done by adults and children alike. For adults who want to be healthier and lose weight this may be a great option. If you are new to a plant-based diet, there are vegan protein options out there that will help provide your body with the protein it needs, while giving you a variety of food. Some of these vegan protein options are grains, beans, seitan, soy, nuts, and leafy greens. You can ease your way into a plant-based diet by going meatless 1-3 times per week. Also by focusing on less red meat and eating more poultry, eggs, and vegan protein sources, you’ll still receive some of the health benefits of going meatless. Other foods to eat would be fresh fruits & vegetables, low fat foods, and whole grains. Are you wanting to go vegetarian and aren’t sure how? Or are you wanting to consume less animal products but feel lost? Don’t worry! The Elite Health Coaching Veggie Pledge is here to help! You’ll get 10 days worth of personalized emails to help you stay motivated with tips and recommendations on how to cut out the unwanted animal products in your life! 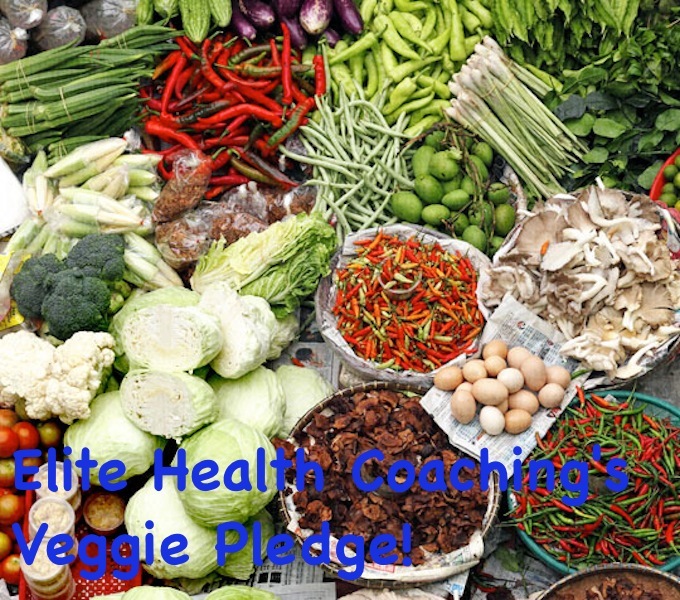 Why should you take the Elite Health Coaching Veggie Pledge? Get recipes and tips on how to increase your vegetable intake! Are you ready to take the Veggie Pledge? Sign up for $25.00 here! Halloween is just around the corner! Are you excited?? We managed to get the house looking spooky a few weeks ago when we had some free time. The kids love having the house look a little spooky. Then we are going to head to a local farm who has a huge pumpkin patch to get some pumpkins so we can carve them before Halloween. The local farm is really great and really embraces Halloween. They have pumpkins of all sizes along with wheelbarrows to help you carry them. They also have a petting zoo, hay tower, small kid-friendly corn maze, and a store where they sell produce that they’ve grown along with locally raised beefalo. I’ve never tried beefalo, but I plan on picking some up when we visit the farm. It is kind of neat too because they offer it in bulk quantities. It’d be so nice to have a stock of meat in the freezer to use throughout the year. The kids are excited about their costumes. My daughter is going to be a fairy & my son wants to be something scary. This is the first year he can wear a mask to school and he is so excited about this! I’m sure he will find an awesome costume that will end up scaring his sister too. 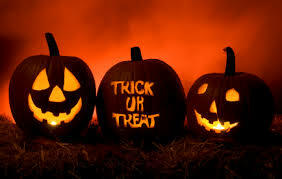 What types of traditions do you have for Halloween? What are you dressing up as? This is on the menu this week! 🙂 Can’t wait! Preheat oven to 350. Brown meat with onion. Drain. Then add flour, salt, black pepper, cayenne, and mustard powder. Mix well. Slowly add beef broth and cook until slightly thick, several minutes over medium heat. Add carrots, celery, and corn. Pour into a casserole dish that has been sprayed with non-stick cooking spray. Spread the potatoes over mixture and top with cheddar cheese. Bake for 30 minutes. Do not drink your calories. A lot of us end up drinking a lot of calories during the day. These can be from soda, fruit juices, sweetened teas, and other beverages. One easy way to drop a few pounds is to increase your water intake. If you get bored of water, mix it up with black coffee and tea to give you some variety. Skip the fried foods. As good as they may be, try going for something grilled, baked, broiled, or steamed. This goes for all aspects of your meal (protein, veggies, bread, etc.). If eating at a restaurant, try to eat as healthy as possible. Skip the fried foods, ask for dressing on the side, and even get your burger/salad/sandwich without the cheese. Little things like this will lower the amount of calories you are eating per day. When you are craving something sweet, try to keep that sweet tooth at bay with sweet fruit like pineapple, grapefruit, or berries. They offer a lot of benefits and don’t contain as many calories as cookies, candy bars, or other junk food items. When making dinner, try to skip the white stuff. This includes refined sugars, refined flours, white rice, etc. Try to make a dinner that is sugar-free and use whole grains rather than refined grains. Give plain yogurt a try. Look for a plain yogurt that does not have any added sugars listed in the ingredients. Rather than relying on the food companies to sweeten it for you, try adding in your own fruit or honey to add flavor. This cuts down on the artificial ingredients and benefits you more when it’s local honey and fresh fruit.